I love Christmas. Love it. I love everything about it, especially now that my daughter is old enough to get the fun parts (and she is the BEST at opening presents — gets excited about everything, even wants to wear all the new clothes at once). Last year we made cookies for Santa in our Christmas Eve jammies, and she got money and an M&M from her grandmother’s advent calendar every time she was over there. This year, I am determined to make a gingerbread house with her. No one seems to make a gluten-free gingerbread house kit, so ours will have to be from scratch. So it will have lots of flawscharacter. I love making Christmas cards almost as much as I love Christmas. I can’t take a straight picture. I’ve been itching to use the Festive Flurry stamp set, and the matching framelits, of course. Last night, I was torn between making a card using Daydream Medallions, which I’ve been neglecting lately, and making a card using the Festive Flurry set. So I grabbed both to see if any of the snowflakes would fit inside the big medallion. And then I had visions of that big medallion being embossed in silver or gold, and I got excited, and embossing powder was flying everywhere. Then I just couldn’t stop embossing, as you can see. 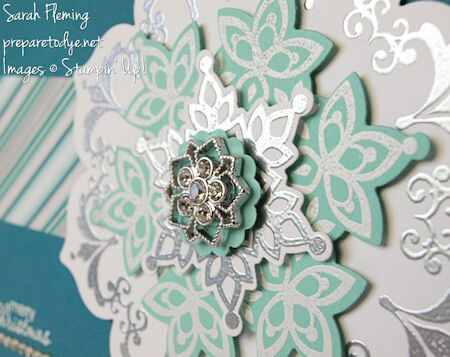 I embossed the big medallion in silver on Whisper White and cut it out with the coordinating Floral Frames framelit, then embossed the medium-sized snowflake in white on Coastal Cabana, then the small one in silver on Whisper White again. And then it looked a little unfinished, so I had to add one of the Frosted Finishes embellishments. But it looked a little funky since the snowflake has a 6-point center, and the Frosted Finishes are 5-point… So I added a little 7/8″ scalloped circle. Then I was happy. 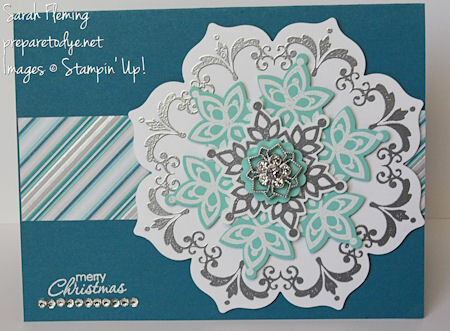 I added a strip of Winter Frost designer series paper to my card, embossed the sentiment and underlined it with a strip of rhinestones, and attached my big decoration. The big decoration, by the way, would make a fun Christmas ornament. Make two of them and glue them together back-to-back with a loop of the 1/8″ silver ribbon between the layers, and you have an easy decoration with a lot of wow. Today is the last day to sign up for my August Stamp-of-the-Month Club. Comment here or at the original link or email me if you’d like to subscribe. If you have already subscribed, you will hear from me soon! Paper Pumpkin is on sale through the end of August! If you subscribe before August 31st, you will receive your first two months of Paper Pumpkin for only $10! You may skip or cancel at any time. Give it a try! Make sure to enter the promo code PUMPKINDEAL. Visit my Stampin’ Up! store for these and other great products! See you soon.